Kitchen knife set is a very simple and basic tool for a cook, which includes a paring knife to cut small fruits and vegetables, a utility knife, a cutting knife, and a chef’s knife. Chef’s knife is your best companion for dicing and slicing foods on your cutting board. Plastic is not good as cutting board as it contaminates food. Wood is naturally a safe material. Plastic is dishwasher safe or you can soak in soapy water but you cannot soak wooden board. Despite being made of hardwood, wood chopping or cutting boards are soft enough for knife’s edges unlike plastic. It is not advised to use tile, stone, or marble to cut veggies on. For chopping and dicing, we recommend forged steel as they are durable, strong, and easy to handle. They also never bend and are value for money. I know you are looking for a razor-sharp, best quality knife which is easy to hold. You might be a cooking enthusiastic looking for a new set to start with or a veteran chef who wants something new. Some metal knives are claimed to be dishwasher safe on the top rack and make sure anything is not touching it that can chip or dull the blade. Also look at the instructions from the manufacturers. They are very simple to clean and you might not like to risk its blade by putting in the dishwasher. Paring Knife – It is used to slice small vegetables like garlic, cloves, herbs, etc. and for prepping garnishes and intricate cutting. Chef’s Knife – It is a multi use knife to dice, chop, slice, and mince food and different ingredients. Carving Knife – It is a slicing knife for slicing or carving poultry, meat, and fish and it is good for even and large slices. Slicer – Designed for slicing roasts like roast beef, the slicer has superior edge to keep lean slices from sticking to it. Fillet Knife – It is a sharp blade used to remove waste and bones from meat evenly and precisely. Bread Knife – It has serrated edges which slice the baked goods and French bread evenly. Boning Knife – This narrow blade is flexible and stiff and makes it easy to separate chicken or meat from trim fat and bone. Utility Knife – This sandwich knife is good for daily cutting tasks. Tomato Knife – It has serrated edge ensures smooth penetration of tomato skin. Peeling Knife – As the name suggests, it peels fruits and vegetables with curved edge smoothly and shapes them well. A knife tang is a back portion of blade where it extracts and connects to a handle. You can find different tang designs and looks. A full size knife tang covers the full length of gripping area of handle. It may or may not be wide enough. To be frank, let me start by saying that considering to buy a kitchen knife set is a terrible idea. It is true that you can get a set of knife for a reasonable price and you could boast about having those knives in your kitchen, however, most of the time we have witnessed such products proving t be useless within a few months. However, this being told there are only a few brands/manufacturers who really market top quality and long lasting knife sets. If are serious about the quality of the product you buy, do not rush in selecting the product. You should definitely consider a few factors before you purchase a kitchen knife set. Quality – As I mentioned in the beginning, a majority of the knife sets tend to come with low-quality knives. However, if you are careful enough to check the specification, you could save the trouble of wasting the money over poor products. Brand – Top brands always see to the fact that they market high-quality products and not low-quality products that could ruin their reputation. When it comes to knives, quality and lifespan of the knife are related to the cost of the product, but, this does not mean that all knife sets with an expensive price tag are of top quality. But, brands like Utopia kitchen, Ginsu, Vremi, Chicago cutlery etc has earned a reputation for the top-quality products they market. So, it is very important that you consider the brand and its reputation before purchasing a knife set from that particular brand. The number of items – It is a common trend all around the world that, combo’s come with many unuseful items. 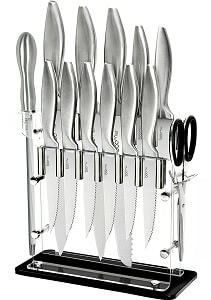 This is common with knife sets, we have seen a few knife sets with knives that are least used in the kitchen. Few of them come in a size, which makes it almost impossible to use it. So, it is very important that you check the specification for the item list and make sure that the product you are planning to purchase consist of the knives you could use and not some set with unuseful knives. PS: there are thousands of knife set models on the market right now, be patient enough to check the specification and purchase a suitable product. Weight – Weight of the knife is very important, a butcher might require a knife with a heavyweight feature, but a kitchen chef or a cook might require a knife with much lesser weight. It is very important that you check the weight of the knife you buy, you will not be comfortable using the product if you choose a set with knives of wrong weight proportion. Balance – Most of the users do not have any deep idea on why balancing is very important when it comes to kitchen knives. However, the difference and importance could be understood once they use an unbalanced knife. Balanced knives are easy to handle and use, on the other hand, unbalanced knives could cause injuries. So, it is very important to choose a knife set with overall well-balanced knives. 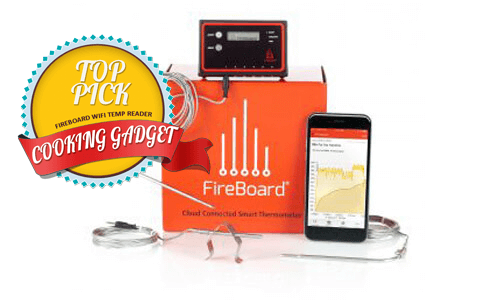 Customer reviews – Believe it or not, this is where all the truth about the product could be found. A manufacturer could claim anything as they wish, but the customer reviews commonly reveal everything about the product. Reading the customer reviews can help you decide which product is good. Conclusion – Buying a kitchen knife set is a good choice, but you should know exactly how to choose the product. Most of the expert’s comment that, a majority of the knife sets that are available on the market today are not worth the money you pay. However, there are brands/manufacturers who offer kitchen knife sets that are comparatively better than any other brands. Below I have mentioned the list of top ten best kitchen knife sets that will help you purchase the best kitchen knife set on the market. Chicago Cutlery Fusion 18-Pc block set is the perfect blend for precise performance and sleek design. 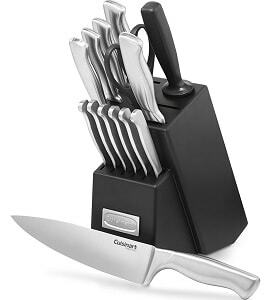 It is an 18-piece block set which has stainless steel knives and comfort grip to ensure great balance, sharpness, and control. Each knife has got superior edge with Taper Grind Edge Technology. 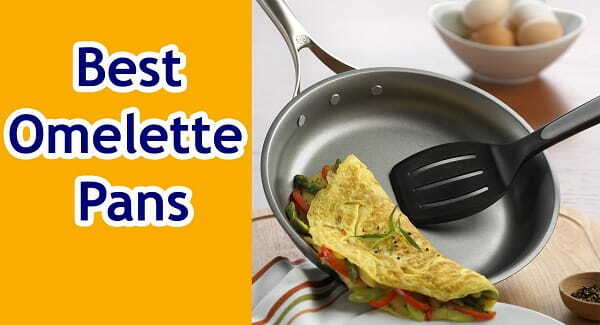 It consists of huge range of knives to meet all your needs for food preparation. The knife set includes huge range of high performance knives for different cutting needs. 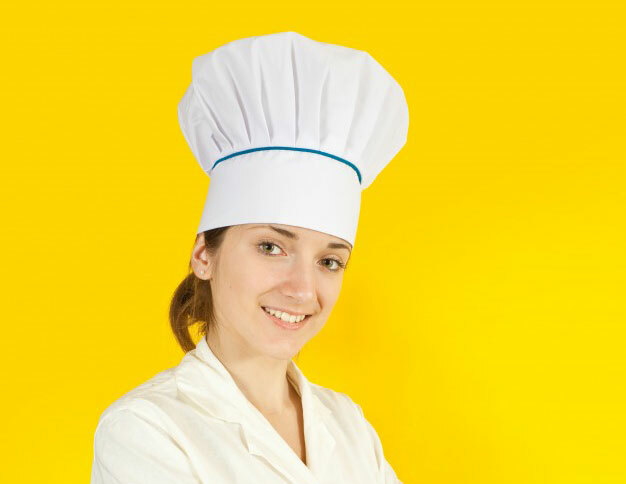 Unleash the professional chef in you with great confidence and control in handling. It features stainless steel plates on handles and top quality pine wood block. 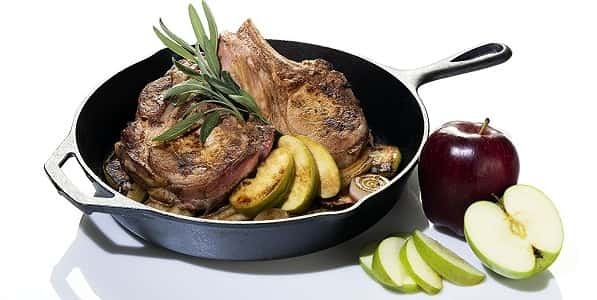 Cuisinart is a well-established cookware and kitchen utensils brand in the USA and No.1 Bestseller for its functionality and artisanship in Amazon.com. 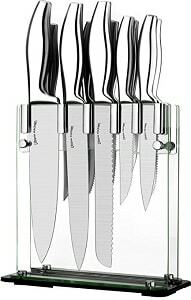 This stainless steel block set includes 15 pieces of knives with storage block. The wooden block is painted black matte which is made of robust material and is easy to clean. The block set also includes hot-forged 4.5” steak knives you can proudly use at your own dining table. These edges are beautiful and serrated well to glide through the steaks and pointed well for superior cutting edge. Handle also don’t slides thanks to its brushed finish. All knives are made of high quality stainless steel blades for precision and accuracy. All of these knives are light enough with sharp edge for gradual tapering. These all are full tang knives and dishwasher safe. But it is still recommended to hand wash and towel dry them. Stone Boomer Super Sharp 14-Piece Stainless Steel knife set is a stunning collection for your kitchen. It is the first choice for cooking and baking for each chef. All of these knives are made of high quality stainless steel to serve the pros. It is made of premium material which never rusts, tarnishes, or corrodes. All blades in these knives are made of heavy duty and strong #430 restaurant-grade steel. It is FDA approved knife set for commercial and domestic use. These lightweight knives are easy to maintain and use with its tapered handles that are ergonomically designed for your hand to ensure smooth control and comfort for cutting, mincing, slicing, and chopping fruits and vegetables. It is designed for all food types like sushi, meat, salads, butter, and cakes. So, you never have to worry about knives to crack or break apart while using. It also includes a sharpener to keep your knives razor sharp for longer. It is a perfect gift for wedding, birthday, BBQ, graduation, anniversary, holiday, and family. Even better, you can gift it to yourself because you also deserves better. The high carbon German steel knife set from Mercer Culinary comes with tempered glass block or with wood block to easily store your knives. The knives have brushed finish and the glass holder is easy to wash after getting two thumb screws out. The blades are sharp enough to cut rock-hard turnip as well as carrots. But they cannot cut through bone. To do this task, you would need a bone saw, a cleaver, or a butcher’s knife. But they can separate steaks from bones. The knives are tough and can resist corrosion well and made of high alloy steel. It is also easy to maintain. It has plastic compound and rubber black handle to ensure proper grasp in hands. You can have more sharpness and hand stability for longer period for cutting and chopping tasks with tapered ground edges. For best results, it is recommended to wash by hands as dishwasher may dull the metal and handle. 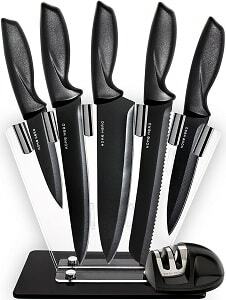 The kitchen knives set from Home Hero includes 7 stainless steel non-stick coated chef knife, carving knife, bread knife, utility knife, acrylic stand, paring knife and dual stage sharpener. All the knives are made of stainless steel and covered with colored non-stick coating to keep food from sticking to the blades without changing the taste of food. These knives are easy to clean and are dishwasher safe on top rack. It has V-grip base to use on counters without risk of slipping. It has quick edge-to-edge capabilities on carbide blades and has ceramic rods for fine edge. It ensures proper control and comfort with soft grip handle. It has reflective black veneer and impact resistant acrylic. Look wise, it can add grace to your kitchen. 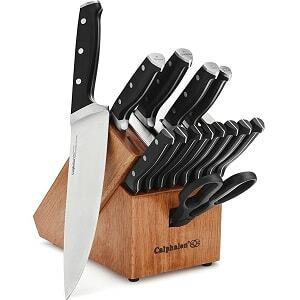 The Calphalon Classic Self-Sharpening cutlery knife set is designed well to keep your knives super sharp for longer. It has a versatile range of cutters, including built-in ceramic sharpeners in rubber-wood knife block which sharpens the blades automatically. 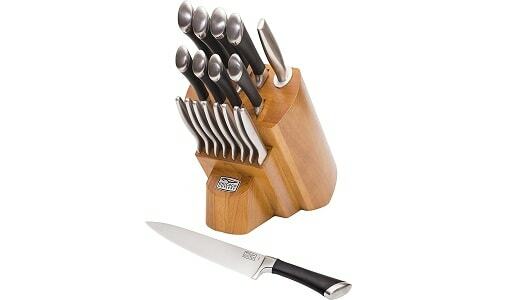 In this set, the kitchen knives are made with stainless high-carbon steel blades that can resist rust. 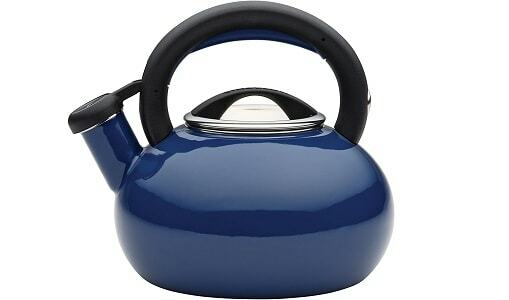 It has triple-riveted handles to ensure smooth and sturdy grip and ensures great strength with full tang body. With full lifetime warranty, you can ensure peace of mind after buying it. The cutlery set includes 15 knives for slicing, chopping, cutting, mincing, and other jobs. Santoku and chef’s knife is included for daily chopping and slicing tasks. Its utility knife is used to cut delicate items like bread, tomatoes and nimble paring knife for peeling fruits. It also has 8 steak knives to cut thick chops and meat. Overall, the set looks quite impressive. The set is pretty sleek and looks more premium than what you will pay for it. The cooking knives are easy to handle and lightweight. It will come handy when it comes to trim down the pieces of meat and to chop onions. In addition, the steak knives in this set are a lot lighter. If you don’t like the traditional bulky steak knives that you have also spotted at some restaurants, Utopia Kitchen knife set should be your next choice. Knives feel sharp and strong and design is impressive. It’s really a good knife set for its price. 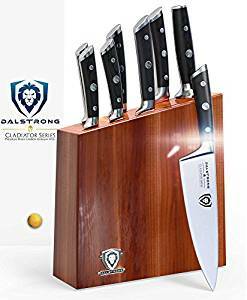 This knife set consists of 8” bread knife, 8” chef knife, 5” utility knife, 8” slicing knife, six 4.5” steak knives and 3.5” paring knife. Bored of dull and boring steel or iron utensils? 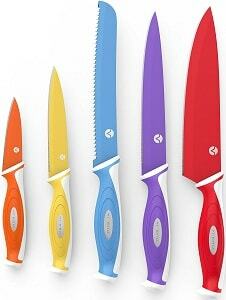 Add colors to your kitchen with Vremi colorful knife set. It has all the essential knives you want in vivid rainbow colors – 1 blue serrated knife, 1 red chef knife, 1 orange paring knife, 1 yellow utility knife, and 1 purple carving knife. These knives come with BPA free blade sheaths. These stainless steel knives are durable, versatile and high quality to slice, chop, carve, dice and cut. These knives are known for their colorful design to look as sharp as they actually are. 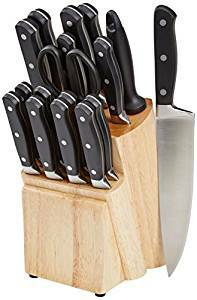 The 18-piece knife set from AmazonBasics with premium wooden block is a great addition to your kitchen. It has a knife for almost every purpose, such as chopping, dicing, slicing etc. Whether you are just a casual cook or a seasoned chef, this set will come handy for different recipes. The set comes with huge range of quality cutlery. All of the blades are honed with precision and made of high-quality stainless steel to ensure prolonged sharpness and great cutting performance. All of the blades are sharpened well. The set also includes a sharpener to ensure its sharp edge every time on the knives, except eight steak knives, that have micro-serrated edges. DALSTRONG German HC Steel knives are razor-sharp like the blade of Rambo. These knives are strong, well-managed and made with precision. The handles are easy to grip on as they are of dark grey or light black wood. The set comes with solid wood block. The knives are handcrafted with attention to detail with perfect finish and no cornered edges to get painful when chopping or slicing a bunch of food and cause fatigue. It has got solid grip and light weight. Stainless steel is rust proof. Hence, you can cut lime, tomatoes, and other citric foods without any health risk. On the other side, carbon steel blades rust by cutting acidic foods and leaving it wet. But it retains its sharpness for longer period. It is always better to cut your food on hardwood cutting board as wood is soft for the blade. Plastic boards are hard and can damage the knife’s cutting edge. You will want to wash plastic boars with detergent under warm water, especially when you cut raw meat over it. Always keep knives in a place away from other utensils. It is better to wash knives by hand rather than detergent and rinse and dry with towel. Knife blades are not always dishwasher safe and their blades are damaged with other utensils. Knives become dull and chip. So, keep them in utensils drawer without getting contracted with other items. It is better to put them in blade guard sheath or plastic sleeves which come with it or can be bought separately. 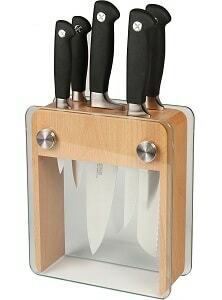 To store each knife separately as per its size, some knives are available in wooden block. It ensures safety and sharpness of knife. You need to sharpen steel knives more often to retain the razor sharp edge for longer. This way, you may want to use an electric knife sharpener, honing steel or whetstone. For steel knives, you might also like high-power electric diamond knife sharpeners. You can use electric diamond high-power knife sharpener for steel and ceramic knives. For best results, use a honing rod or whetstone to sharpen your knife blades. Check instructions from the manufacturers for recommended sharpener to use. It is advised to hand wash your steel knives with water and soap and dry quickly. Don’t soak wood-handled knives as they may lose natural oils from handles. Steel knives are not dishwasher safe as it may cause nicks on the edges of blades. The detergent and heat also leads to corrosion on the knives and handle may be damaged. Knives are not made to cut through bones. They are not used to pry open jars and cans. Use screwdrivers instead. Keep your knives away from children’s reach. Never leave in a drawer as they can come into touch of other utensils. It is better to keep them in sheaths or blade protectors. We hope the information above would help you choose the best kitchen knives out there. Before buying your next knife sets or specialty knife as a gift for your family or yourself, feel free to read the buying instructions above.